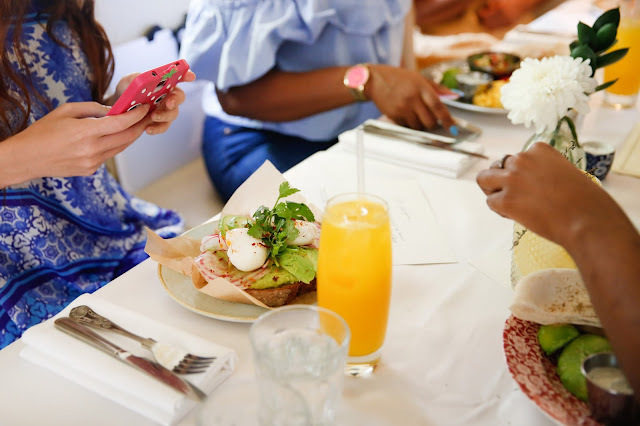 If you guys have followed me for a while, particularly on Instagram, you will know that I am a little bit partial to a nice brunch at the weekends! Breakfast during the week is such a boring experience for me, I've been making my way through a box of weetabix this week so that's why I like to indulge a little at the weekend. 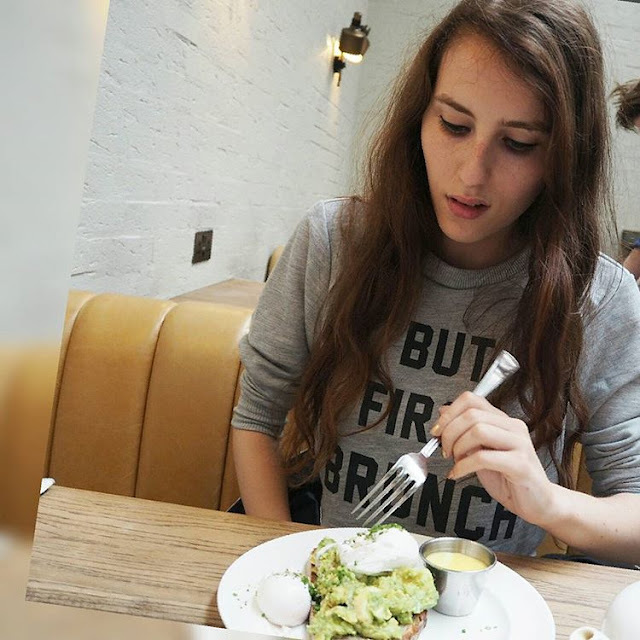 If you asked me what my perfect 24 hours in London would be, it would definitely start with brunch! Usually it's all about the avocado but since I had five different sitting to attend to this week, I mixed up my choices a little! My birthday plans were left completely up Andrew this year and luckily for me, my boyfriend knows me well. This was on the morning of my actual birthday and I was so excited because I have wanted to visit duck and waffle for such a long time now. We got in the lift up to the 40th floor and sat at a window seat looking out over London. Compared to the sky garden and even the shard, it seemed so much higher and whilst it was pretty scary, it was also pretty amazing. I popped to the toilet and when I came back, Andrew had ordered two belinis! Champagne for breakfast it was then! I kinda wanted to order the duck and waffle, because, well you know; but the duck egg en cocotte sounded too good to pass up. So whilst Andrew got stuck into his full English, I had a pan of melted gruyere cheese, wild mushrooms and truffle with a fried duck egg in the middle and a basket of toasted bread soldiers. It was delicious and a bit over indulgent for breakfast but it was my birthday after all! As we finished our drinks, the manager brought over a cute little cake with a candle in it which was a nice touch and just the sweet bite I needed needed to finish off. We've been here a few of time now because its one of our favorite places for breakfast! 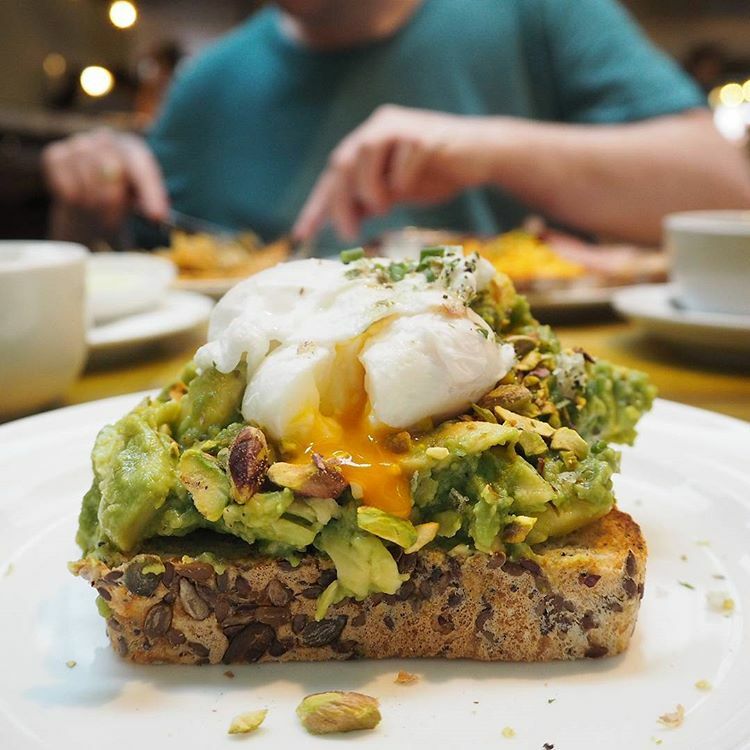 The eggs are always poached to perfection plus I love that the avotoast comes with pistachios for a little extra crunch. After feeling ill every single time I eat bread, this time, I though you know what!? Why do I keep doing this to myself and decided to order gluten free to see what happened. I was a bit scared to eat it at first because even though it was gluten free, it was still a slice of bread and I was convinced that it was going to make me feel ill plus I wasn't even sure that I was going to like it. I needn't have worried though, because the thick slice of seeded bread that arrived with my breakfast was delicious and I actually really enjoyed it's crumbly texture. Afterwards, low and behold no stomach ache, no acid reflux and no falling asleep. Problem solved! Andrew had booked a super weekend for us and the first night involved a stay at The Rosewood Hotel. For breakfast in the morning, we had three options; room service, the mirror room or the holborn dining room. I wanted to see as much of the hotel as I could so that put a cross over room service. We first popped to the mirror room but it was a bit too loungey for us as so we moved on to The Holborn Dining room in the courtyard of the hotel, which was much more of a proper restaurant. We both loved the style and don't ask me how but strangely, it reminded us both of main street Disney, it just had that vibe. Anyway I thought I'd try something different this morning and went for scrambled eggs and smoked salmon, I also ordered an exotic fruit salad, tea and juice and some more gluten free bread! It was quite expensive but luckily it was all included in the price of our room. The next evening, we stayed at another amazing hotel and decided to spend our last morning together in bed. Whilst they have the rooms and design down to a T, we weren't so impressed with the breakfast. It was a little bit cold when it arrived and they forgot a smoothie, which was quickly brought up afterward, although it was tasteless. This definitely won't stop us from going back though as I would count it as my new favourite hotel, we just won't be booking breakfast next time! This one was a few days later but I took it as a chance to celebrate my first full week of being 23! I popped down to Mayfair for breakfast with Farfetch. As I like to describe them, its like ASOS but for designer brands - they have a selection of over 400 boutiques and some incredible stock. 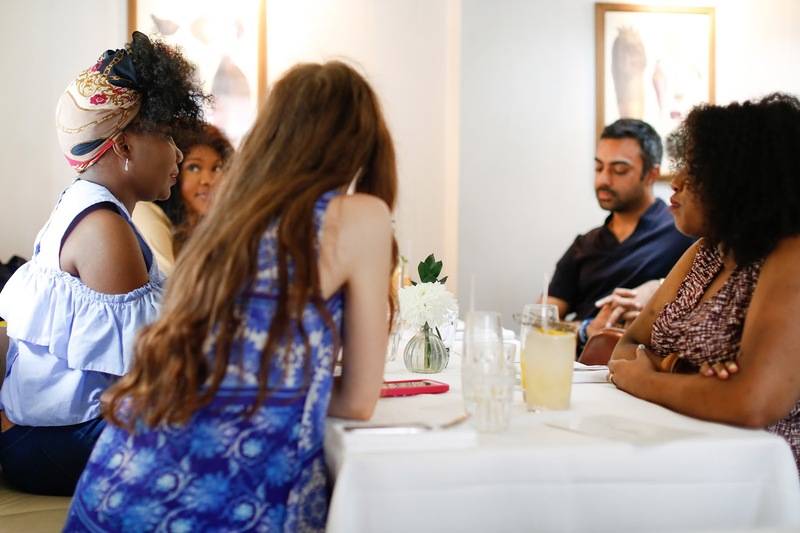 It was a great opportunity to hear about blogging from some different points of view, especially as some of them were fashion magazines as well as blogs and of course catch up with the Laurren who arranged it all! Of course I went to the avotoast yet again and a glass of fresh orange juice. I loved that they spread the toast with avocado before they piled it on top as well. There were chilli seeds on it which I was not expecting but those were easily scraped off! Been dreaming of trying The Rosewood's brunch for a while now and it looks like now, I really have to get going! Most of my breakfast favourites are local to me, but if you're ever near Angel, I really recommend you give Radical & Victuallers or Ottolenghi a go! !